UPDATED: Denon and Marantz release AirPlay upgrade | What Hi-Fi? Denon has added AirPlay compatibility to its CEOL network music system. The upgrade costs £39 and is available from the Denon website. The CEOL (or RCD-N7) system joins three other models in the Denon range which are already AirPlay compatible via the same software upgrade (see original story below). Owners will need a home wi-fi system supporting 802.11g (54Mbps) or 802.11n (150Mbps) wi-fi. Denon's AirPlay upgrade is not currently compatible with 802.11b (11Mbps) wi-fi, but the company hopes to release a firmware upgrade for 802.11b by the end of February. Denon and Marantz have today released the AirPlay upgrade for their respective products. 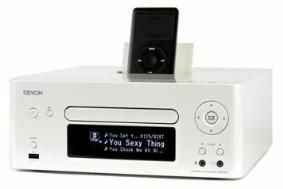 It allows users to stream music from their PC/Mac iTunes collections – or directly from an iPad/iPhone/iPod – to their hi-fi or AV components. Apple's AirPlay music streaming capability is now available on the Denon AVR-4311, AVR-3311 and AVR-A100 multichannel receivers. It costs 49 Euros and can be downloaded from www.denon-upgrade.eu. As for Marantz, AirPlay support is available on the Melody Media M-CR603 mini system, the NA7004 network audio player, the SR7005 AV receiver and AV7005 AV preamp.